Volume in Teamspeak seems OK; then you start up a game in Steam. The volume then drops to the point you can hardly hear other users, perhaps not at all, depending on the in-game volume. If you look at your Volume Mixer, you'll see the volume bar for Teamspeak has been lowered. 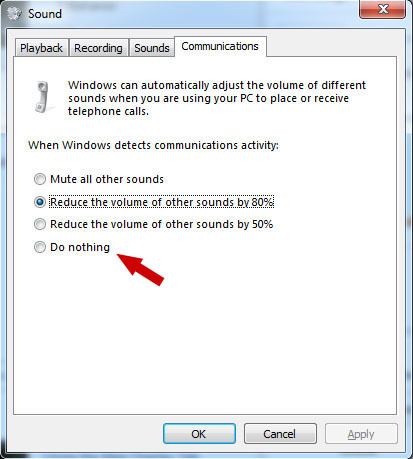 Windows 7 is trying to be nice, and lowering your volume when it detects another communication device. It's designed for PC based phone calls, much like how a Bluetooth phone will turn down/off the sound in your car radio for incoming calls. In our case, Win 7 thinks your Steam VOIP is an incoming call, turning down Teamspeak. Switch it to "Do Nothing"